Fashion digital clock There are 2 products. Here you can buy the Alarm clock that speaks Spanish. With a modern design and technology there are several versions. 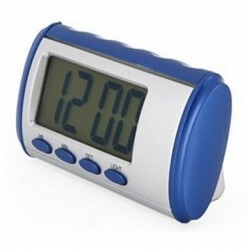 The alarm speaker is a digital clock that when you press the top it says the time loudly and clearly. Versions in addition they take a detector of sound tell the time without the need of touching it, activated by sound with a hand or voice, or even with just touching the table. Thought for the elderly or people with reduced visibility, it is also a device talker and parlanchiín education for children. Buy now the alarm clock that speaks to you, and it will be your best gift, original, stylish and educational. Silicon e-Shop makes available to customers an online sales system that takes care of both the prices of the products as the manufacturers and the quality of the same, if you want to buy with manufacturer's warranty and highly recognized brands in the world of electronics and computer science, don't miss to enter in the different sections of the online store and buy everything as much as you want, you have electronic products from little more than a euro, buy your watch, scale for kitchen, digital scale reduced in size and thousands of products online to receive your order in just 24 hours. Buy digital Watches, wall silent. 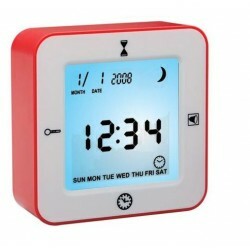 Digital clocks wall with LED LCD display allows a comfortable reading of the time thanks to the size of their digits. To see the time to a greater or lesser distance with all the data: hour and minutes, day of month, day of week, month, year and temperature. In SILICON ELECTRONIC STORE would recommend these watches for all types of environments and needs, for its design and the great advantage that they never make noise. Also have Alarm function or alarm clock and countdown. You can schedule an important event on the calendar and the clock and its alarm will warn you when you reach the exact time. features charging indicator of the battery. The watch is large format you will be able to decorate your home. For Office, kitchen, living room etc, in every environment encajrá one of our models of digital clock wall. SILICON presents you the easiest way to see the time, date and temperature, in a single digital display, which integrates the wall clock. It has a modern design, clean and rugged. Available in black or blue, will be great in any room of your home that you want to put it. Watches and alarm clocks designed for your rest, modern and functional Design with large numbers that are projected on the ceiling or wall. Now you can sleep easy and don't need to have the glasses close by, you can sleep deeply, or if you don't want to lift the head and you want to see the time from your position lying on the bed or sofa. With these watches with Projector time it is the end of sleep problems and stress. These Watches Projectors Shop Silicon ELECTRONICS are much more than an Alarm Clock: take calendarío, " alarms programmable, thermometer and everything you need. With a futuristic design for a duration in use during the whole life. A modern watch made also to the most elegant, and this design goes with everything and draws the attention by its originality at the time of projecting the passage of time. With different versions with Battery or with cable to the network socket. These alarm Clocks LED Projector is not only for Geeks and have an assured future in the decoration of your house.